BRAMPTON - The second annual Youth Making a Difference Workshop, hosted by the local youth-run non-profit ACCESS Charity, is being held on March 24, 2010 in Brampton, Ontario. Registration is due March 5. The purpose of the event is to educate, empower, raise awareness and work in solidarity for change with the youth in Peel Region and beyond. Inspiring guest speakers, community service opportunities, engaging activities and exciting performances await local high school students. This year's workshop theme is Passion to Action, based on youth putting their passions into action; becoming active and involved in issues that are important to them. One of the goals is to encourage and enable youth to engage with community-based organizations to explore opportunities to transform their interests into action through local volunteerism. Event Schedule, participating organizations, and a promotional video are also available on the event website. A printable poster (11" x 17") can be downloaded here. 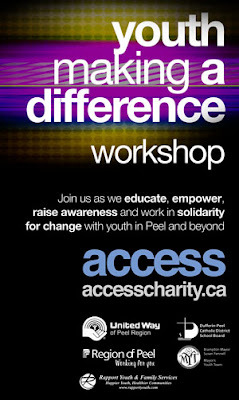 Last year's workshop, held in Brampton in May 2009, was an initiative of ACCESS Charity and Continental Rescue Africa, both local youth-run organizations. This year, the event is hosted by ACCESS and is funded in part by the Youth in Action Grant (United Way & Region of Peel) and is supported by the Dufferin-Peel Catholic District School Board, Institute for Youth Citizenship, Brampton Mayor's Youth Team, and Rapport Youth & Family Services.